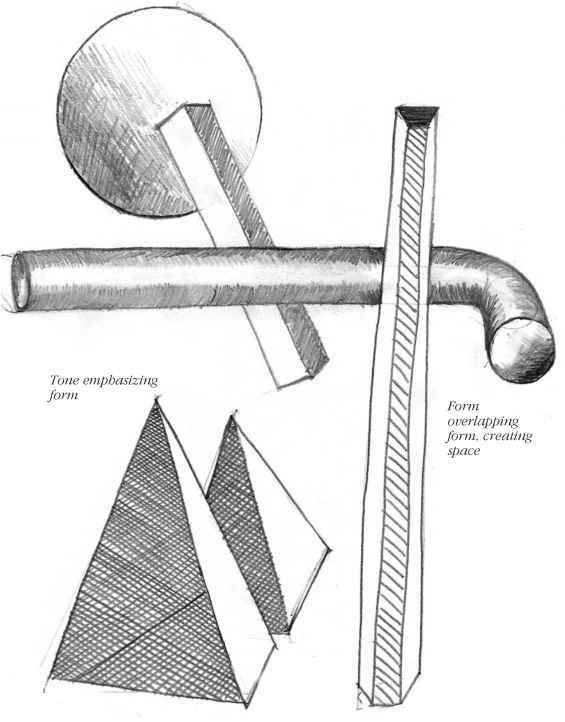 form of geometry to establish the angles. As with the example of the isometric drawing, I have established the 30° angle from using a 90° right angle. You can place a right angle to the vertical and then make an approximation as to the angle of your observation. When you feel confident that the angles of the lines you are about to draw are right, use a ruler to draw them to the point where they converge. At this point you will have established for that building or object one of its vanishing points. It is on this point also that the horizon line, or the eye level, is established. Now you can draw in the eye level line by simply making a horizontal line across your paper. There is a simple rule to remember for perspective. All the perspective lines that are above eye level will converge downward to a particular vanishing point on the horizon line. The same is true for those perspective lines that lie below the eye level, only they will converge upwards to the horizon line to a particular vanishing point. 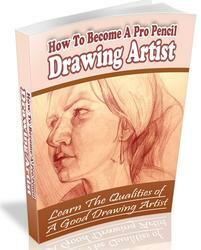 The accuracy of these measured angles is vital to the success of the drawing. Once you have the two converging lines from your first vertical, you can use them as guides to draw the rest of the building. 3/ Decide how long the front face of the building is by looking back at the composition through the window mount. Put in a vertical line to denote the end of the building. This will fit exactly between the two converging lines to give us the correct perspective. One can now do the same to the other side of the building, using the same process. However, you will notice that the perspective point on this occasion goes off the other side of the picture. Do not worry about this - it happens in most perspective drawings. 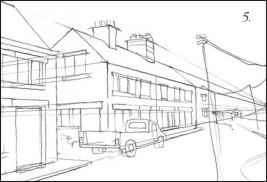 In this detail we have extended the drawing perspectivally forward to draw the row of houses in the foreground. 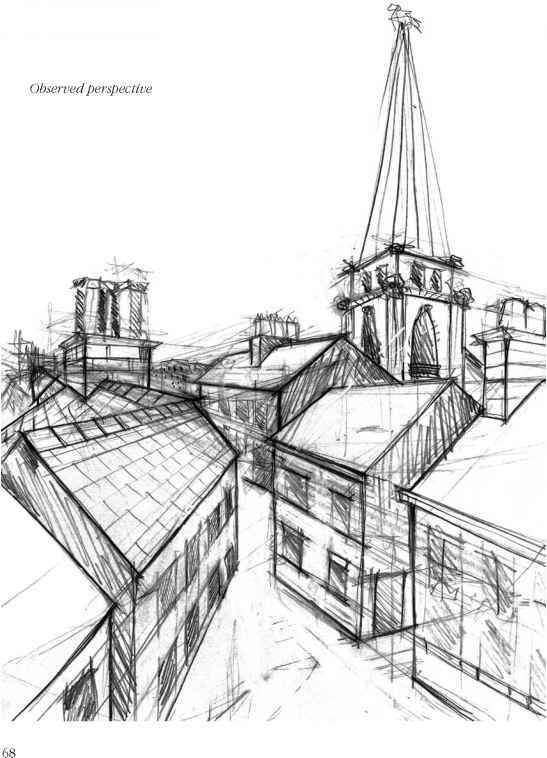 This has been achieved by extending the perspective lines that come from the vanishing point on the horizon line, and then placing the vertical line in to denote the edge of the building. 4/ Add the roof and the chimney pots so the building now has its basic structure. 5/ Architectural information such as doors, windows and pavements are now put in. 6/ We have now established the perspectival basis of the composition. At this stage your drawing will lack expression or character. 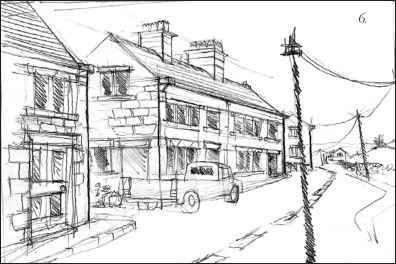 In this final stage we need to put in the elements that make the drawing more real, such as the van, the telegraph poles, the curving side of the road, and the other houses in the background. Finally, it all needs to be brought to life by working over the top of the perspective with free, gestural lines. How to make perspective window mount? How to draw anime hands in pairs? How to draw backgrounds perspective? How draw a realistic background? How to draw roads in perspective? How to drawing using isometric techniques techniques? Do isometric sketches have vanishing points at the observers horizon? How to draw isometric building? How to draw isometric house? How to draw angles in isometric drawings? How to construct an isometric drawing above eye level? How to draw Tsometric Drawing? How to isometric door drawing? How to draw isometric people?